Guan Moye (simplified Chinese: 管谟业; traditional Chinese: 管謨業; pinyin: Guǎn Móyè), known by the pen name Mo Yan (Chinese: 莫言; pinyin: Mò Yán) (born 17 February 1955) is a Chinese novelist and short story writer, described by Donald Morrison in U.S. news magazine TIME as "one of the most famous, oft-banned and widely pirated of all Chinese writers". He has been referred to as the Chinese answer to Franz Kafka or Joseph Heller. Before 2012, he was known to western readers primarily for two novels which formed the basis of the film Red Sorghum. That year he was awarded the Nobel Prize in Literature for his work as a writer "who with hallucinatory realism merges folk tales, history and the contemporary". Mo Yan literally means "Don't Speak" in Chinese." He just won the 2012 Nobel prize for literature today for "works which combine 'hallucinatory realism' with folk tales, history and contemporary life grounded in his native land." 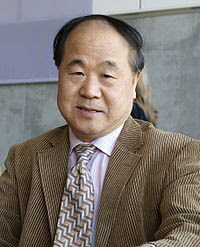 He is known in the West for his novel, Red Sorghum (first published in 1987 in Chinese; in 1993 in English).